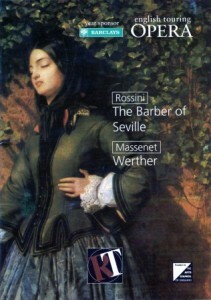 The chance to translate Massenet’s greatest opera came from English Touring Opera for their production by Robert Chevara. It opened at the Richmond Theatre on 18 October 1995. The cast included Timothy Evans-Jones in the title role, Sarah Connolly as Charlotte and Gail Pearson as Sophie; Martin André conducted.